This document is a follow-up of a story that started in 2013. At that time, the Local Development Program, from the Center for Sustainability Studies (GVces) at Getulio Vargas Foundation, was challenged by Childhood Brazil to gather a group of companies willing to build strategies and guidelines aiming at incorporating the Full Protection of Children and Adolescents (C-A) topic into business management, in the context of installation or operation of large projects. So this is how the first Local Development and Large Projects (IDLocal) Initiative emerged. The challenge was there: how to incorporate such a complex topic into business practices when it comes to managing risks related to violation of children and adolescents' rights linked to the arrival and operation of large projects in socially, environmentally and economically fragile territories? And, yet, at the same time, how to incorporate such a symbolic and timely topic, given the future perspective children and adolescents represent in a place? In 2014, some IDLocal member companies decided to accept the challenge to deploy such guidelines, in order to learn more during the process, as well as design a practical guide to implement the guidelines, like a roadmap. This current publication shows the results of this work. The purpose of this Guide is to provide step-by-step instructions on how to implement Business Guidance by actually building and applying the BSC and the strategic map, collectively produced in 2013. In practice, this means formulating metrics, targets and actions for strategic and specific goals for full protection of children and adolescents. We hope this work contributes to the business management of one of the most complex topics of our time. 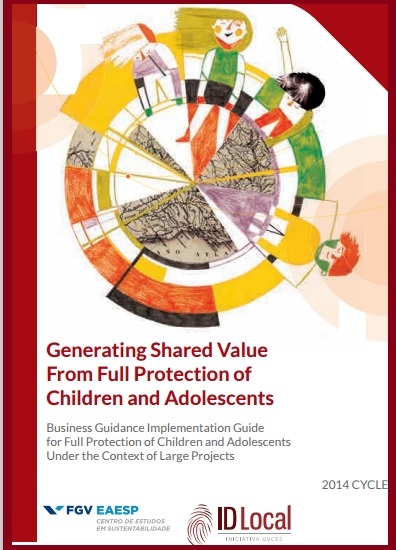 Although the denition of the role organizations play in full protection of children and adolescents may still nd some blurry areas when it comes to responsibilities and obligations, we can spot here a number of opportunities for advances both when it comes to the regulatory framework and self-regulation, particularly because full protection of children and adolescents is an non-negotiable right. Readers will find in this Guide (i) the Balanced Scorecard (BSC) adaptation process aimed at organizations for full protection of children and adolescents; (ii) step-by-step instructions to develop the BSC; (iii) domestic and international trends in corporate responsibility for Full Protection of Children and Adolescents that may support the challenge of incorporating those topics into the company routine, and references (organizations, legal frameworks and business instruments); (iv) reports from pilot projects in BSC development from IDLocal 2014 Cycle participating companies; and, lastly, (v) suggestions of territory follow-up metrics that may help monitoring the territory where the business operates.